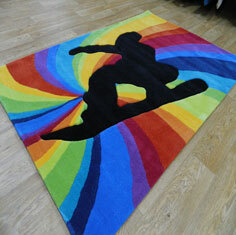 Children's Floor Art rugs - No matter what the age, we always want the best for our little ones. Our Children's Floor Art collection covers a wide age spectrum. Designs such as Princess and Animals cover the younger generation whilst Multi Colour Surfer and Mad Dj tick the demands for the older Xbox savvy generation! The rugs feature child-friendly dyes, the soft hand-tufted acrylic pile is easy to clean and luxurious.